So apparently I’ve not blogged since February, despite saying I would blog my Roaccutane journey and despite me getting up to all sorts since then. I thought I’d start off with a Roaccutane catch up and then dedicate another post/s to what else has been going on lately. As of 13 June I’m five months into my treatment. The awful, awful purge I experienced early this year eased off almost overnight. I’ve been left with quite red/scarred skin but it’s able to be covered with make up fairly easily. At my last appointment I saw the registrar (who of course had stunning skin) who firstly told me off for taking my make up off with wipes. Caroline Hirons would have been proud of the grief she gave me. I politely informed her that I think wipes are the devil but I had been to work that morning and plain old water wasn’t about to get my make up off for her. She decided that she wanted to up my dose to 40mg a day from 20mg but didn’t seem confident in making that decision herself so she called in my consultant who suggested 40mg a day would be good but if I found it too drying I could do 20mg one day and 40mg the next. I’ve opted for the latter and within days of starting the new dose noticed a dramatic difference in how dry my skin and lips became, I’ve also been experiencing small spots along my jaw line but otherwise it’s been going ok.
I’m a long way from being able to go make up free, which by this time last time I was on these meds I was able to, but hopefully one day I’ll feel confident enough in my skin not to worry about it. I’m going back to the hospital for another appointment tomorrow but it feels like progress is slow this time around so I’m predicting staying on the medication for a while longer. 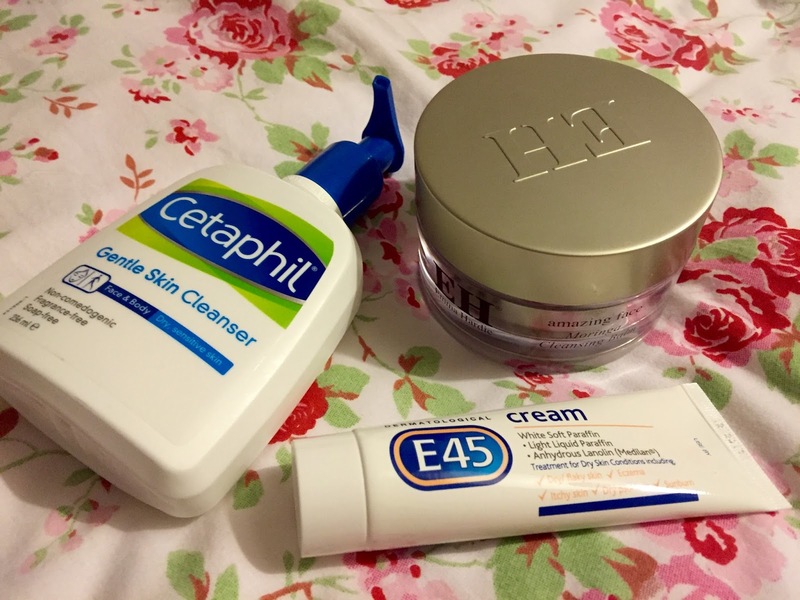 I’m fairly sure that at some point I said I’d explain what my skin care routine is on Roaccutane but as I’m currently only using three products on my skin it’s going to be quick! I’m currently using the Emma Hardie balm, which is gorgeous. I’ve been using this since my skin flared up around Christmas and I’m finding that it’s helping my skin feel not quite as dry as it could. It’s going to run out soon and is too expensive for me to replace at the moment so I’m thinking about swapping to the Boots Botanics balm as I’ve heard good things about that. As basic as you get! I’m using Cetaphil cleanser, which is aimed at sensitive and dry skins. My skin really feels much better after using this. I had tried using the Superfacialist cleanser with rose but that just made my skin sting so I went back to Cetaphil. Good old E45! That’s it. Nothing fancy, no toning of any kind. It’s a very basic three step as my skin can’t handle any more going onto it, I tried toning for a few days maybe a month or so ago but my skin hated it so that stopped sharpish.